This month’s edition of the Mensch Report is one of two shows that feature organizations in the Pottstown area. The first segment of our Pottstown show features Pottstown Memorial Medical Center (PMMC) and TriCounty Community Network (TCN). PMMC is a community healthcare provider that offers a full range of health services including inpatient and outpatient, medical and surgical, and diagnostic and emergency care, to name a few. I was fortunate to sit down with PMMC’s Dr. Richard Newell to talk about the different care and services their facility provides. Following my tour at PMMC, I visited one of TCN’s job labs. TCN brings together more than 90 agencies, businesses and individuals in the local Pottstown community to problem solve on community needs. TCN works to build the capacity of area nonprofits by providing numerous support services and benefits that help organizations better serve their stakeholders. TCN also provides resources and partnership opportunities designed to solve community issues that cannot be solved by one organization alone. One of the programs TCN provides is a job lab. The job lab is available to constituents who need help with building their resume, conducting job searches, practicing interviews and much more. I think you will enjoy this show which sheds light on two outstanding organizations serving the Pottstown community. Senator Mensch visited the H&K Group in Skippack and Naceville Quarry for an episode of the Mensch Report. CEO Scott Haines and COO Jim Haines led the tour. I encourage you to participate in my new survey and share your thoughts on which state government matters are most important to you. You can take this brief survey online. I will be hosting four separate Coffee with Your Senator Events throughout 2017. The first event is scheduled on February 9 from 8:30 a.m. to 10 a.m. at the Perkiomen Township building located at 1 Trappe Road in Collegeville. The event will provide constituents the opportunity to discuss any state-related matters or concerns with me in an open forum setting. There is no cost to attend the event and coffee will be provided. Attendees are encouraged to RSVP by calling 215-541-2388 or by emailing srasmussen@pasen.gov. 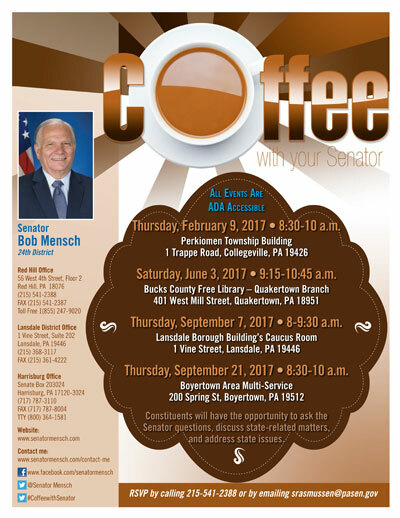 Below you will find the details for all four Coffee with Your Senator opportunities. My office currently has Pennsylvania tax forms available for individuals. To request forms, please call my district office at 215-541-2388. Forms can be mailed to you or picked up in person. My office will have the PA 1000 form/instruction booklet available in late February or early March. Unfortunately the IRS is no longer supplying bulk shipments of tax forms to organizations including my office. If you need to access IRS forms, please visit https://www.irs.gov/forms-pubs/. Constituents can also order IRS forms and publications by visiting https://www.irs.gov/uac/forms-and-publications-by-u-s-mail. Senator Mensch introduced the members and student volunteers from the International Spring Festival to the Senate of Pennsylvania. Since the Property Tax/Rent Rebate Program’s 1971 inception, older and disabled adults have received more than $6.5 billion in property tax and rent relief. The program is funded by the Pennsylvania Lottery and revenue from slots gaming. More than $264 million in property tax and rent rebates have been sent to more than 554,000 homeowners and renters across the state for taxes and rent paid in 2015. The application forms for the Department of Revenue’s Property Tax/Rent Rebate Program are available online for eligible residents to begin claiming rebates on property taxes or rent paid in 2016. My office should be receiving the PA 1000 instruction booklets and forms in late February or early March. If you would like a PA 1000 instruction booklet mailed to you, please call 215-541-2388 and a staff person will assist you. The deadline to apply for a rebate on property taxes or rent paid in 2016 is June 30, 2017. Rebates will be distributed beginning on July 1, as specified by law. 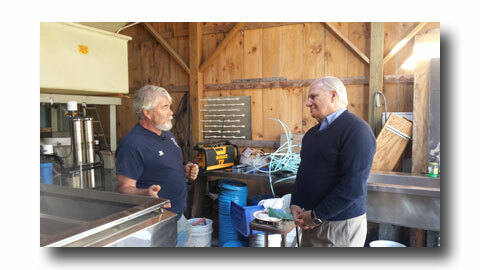 Senator Mensch visited Ridge Valley Farm, owned by Sue and Jim Myers, to get a tour of their maple syrup production. This month we are highlighting the Pennsylvania Treasury Unclaimed Property department. Annually, the PA Treasury receives millions of dollars in unclaimed property--items such as abandoned bank accounts, forgotten stocks, uncashed checks and contents of safety deposit boxes. The property remains available for claim by the owners or their heirs in perpetuity and Treasury serves as the custodian until it can find and verify its rightful legal owner. The Pennsylvania Treasury reunited thousands of Pennsylvanians with a record $175 million in property and money in 2016 bringing the total value of money and items returned since July 1, 2005 to $1.3 billion. Additionally, Treasury collected $400 million in dormant and forgotten property this year. You can check online to see if you have any unclaimed property. If you need assistance navigating the claim process, please call my office at 215-541-2388 and a staff person can assist you. Nature lovers worldwide are pleased the Pennsylvania Game Commission is once again live-streaming the Hanover/Codorus State Park bald eagle nest cam. The PGC, hoping for a completed cycle, from nest building to hatchlings to successful fledging, is offering tips on bald eagle nest etiquette to enhance the experience for people and eagles. During 2016, one hatchling did not survive, a second egg did not hatch, and the nest required some reassembling from the damage of some active squirrels building a nest just below that of the eagles. The adult eagle pair were undaunted as they begin to fortify the remaining nest for 2017. Senator Mensch introduced Steven Diehl to the Senate of Pennsylvania. 3) Any time when the vehicle’s windshield wipers are in continuous or intermittent use due to precipitation or atmospheric moisture including rain, snow, sleet or mist. Pennsylvania State Police have more information on the Rules of the Road.